Adding exterior insulation as an energy saving renovation measure is not always possible for cultural heritage reasons. This study explores the energy saving that can be made if glazing instead is added to a heavy structure as a brick building creating a double skin façade. Extensive measurements have been made in a full-scale building. The building has then been modelled in IDA-ICE and simulations, validated by the measurements, have been made for both an outdoor climate representing the southern part of Sweden, Malmö and for one climate representing the northern part of Finland; Sodankylä. The annual heating energy savings have been calculated for various design combinations; different U-values and for both mechanical exhaust respectively mechanical supply and exhaust ventilation systems. The results show that an energy saving is achieved in the order of 8–38% depending on the design of the building; the glazing and the ventilation system. 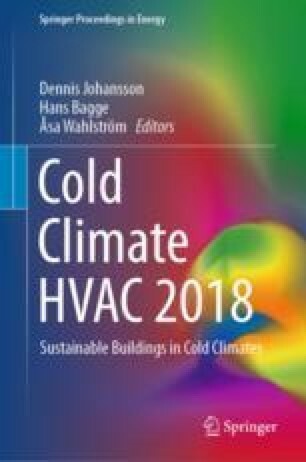 As both a southern and northern climate of Scandinavia are studied the results indicates how this type of renovation measure would perform in general in this part of the world. The Swedish Energy Agency and Tampere University are acknowledged for financing the study. The study is also a result of a co-operation between the Tampere University in Finland and Lund University in Sweden. The city of Malmö is gratefully acknowledged for allowing the analysis to be made, for supplying the measurement data, and for undertaking and financing the renovation including the measurement equipment.